We’d love your help. Let us know what’s wrong with this preview of Soul Made Flesh by Carl Zimmer. In this unprecedented history of a scientific revolution, award-winning author and journalist Carl Zimmer tells the definitive story of the dawn of the age of the brain and modern consciousness. Told here for the first time, the dramatic tale of how the secrets of the brain were discovered in seventeenth-century England unfolds against a turbulent backdrop of civil war, th In this unprecedented history of a scientific revolution, award-winning author and journalist Carl Zimmer tells the definitive story of the dawn of the age of the brain and modern consciousness. Told here for the first time, the dramatic tale of how the secrets of the brain were discovered in seventeenth-century England unfolds against a turbulent backdrop of civil war, the Great Fire of London, and plague. At the beginning of that chaotic century, no one knew how the brain worked or even what it looked like intact. But by the century's close, even the most common conceptions and dominant philosophies had been completely overturned, supplanted by a radical new vision of man, God, and the universe. To ask other readers questions about Soul Made Flesh, please sign up. It’s impossible to talk about the history of the brain – about the history of medicine at large, actually – without also talking about religion and politics and philosophy. Mostly religion, as you might expect. This book tackles all of the above with admirable aplomb, starting off with one of my favorite childhood anecdotes about the ancient Egyptian burial custom of removing the brain through the nostrils because it was clearly a useless organ (how can you not love that; it’s totally disgusting It’s impossible to talk about the history of the brain – about the history of medicine at large, actually – without also talking about religion and politics and philosophy. Mostly religion, as you might expect. This book tackles all of the above with admirable aplomb, starting off with one of my favorite childhood anecdotes about the ancient Egyptian burial custom of removing the brain through the nostrils because it was clearly a useless organ (how can you not love that; it’s totally disgusting!). We hop on through the first anatomists, sojourn a bit with alchemy, pause for natural philosophy, and then settle down in fifteenth-century England for the majority of the book. This is a bit too broad to be classified as a biography of Thomas Willis (the father of neuroscience), but it’s a close thing. It’s a thorough, ranging but focused account of the history of the brain and how we conceive of our conscious minds, our souls, ourselves as animals. And a whole lot of familiar names keep popping up, like Hobbes and Locke (a doctor, which I had forgotten) and the two Roberts (Boyle and Hooke) who are better known for their work in physics and chemistry, but who actually made enormous contributions to the understanding of human respiration and blood oxygenation. Well-researched, entirely lucid, a bit rambling but in the good way. There’s a whole hell of a lot of ground to cover when you start out before we even realized the brain was the seat of consciousness, not to mention the many theologians and anatomists alike who maintained the soul by its nature could not be physical. This book covers most of that very well, particularly in detailing the ebb and flow of experimentation through England’s revolution and restoration. I was unsatisfied by the sudden 350 year leap made in the last chapter, and the rushed treatment of modern nuropharmacology and the potential of MRI studies (what is the brain doing when confronted with some of those awful moral philosophy questions – in situation x you can save five people by killing one, what do you do?). I honestly would have been happier had the book simply maintained its historical focus and stopped in the fifteenth century. Which would have left the “and how it changed the world” part mostly to inference, but I almost would have preferred inference to the rushed and vague cap on an otherwise nuanced account. The writing here is also rather dry. It’s not bad by any stretch of the imagination – it’s more invisible than anything – and I’m spoiled by the last nonfiction I read. Still, it’s a consideration. Very interesting look into the scientific period where people switched from thinking that the heart was the source of the mind to the brain being the source. Also some good writing on the changes in the scientific method during that time. My only complaint is that there was a little too much biography of historical figures for my taste. In Soul Made Flesh (2003), Zimmer describes the scientific revolution of the 17th century in terms of medicine and psychology. Before the 17th century most of medicine was based on Hippocrates and Galen, which in essence was an explanation for the workings of our bodies and diseases in terms of the relative abundance of four bodily fluids. This was not science as we know it, this was all based on deductive logical systems à la Aristotle, mixed with a unhealthy dose of mysticism. René Descartes w In Soul Made Flesh (2003), Zimmer describes the scientific revolution of the 17th century in terms of medicine and psychology. Before the 17th century most of medicine was based on Hippocrates and Galen, which in essence was an explanation for the workings of our bodies and diseases in terms of the relative abundance of four bodily fluids. This was not science as we know it, this was all based on deductive logical systems à la Aristotle, mixed with a unhealthy dose of mysticism. René Descartes was the first natural philosopher to erect a materialistic scientific model of the world: everything is based on the motions and collisions of particles (atoms). Humans differ from the rest of the immaterial matter and animals because humans have an immaterial soul. Later thinkers like Hobbes would take this scientific outlook even further and tried to build politics and ethics on the workings of material particles (i.e. humans). On the other side were empiricists like William Harvey - the discoverer of the function of the heart in terms of blood circulation - who worked in the tradition that Francis Bacon founded (i.e. using experiments to search for truth). In broad outlines, this is the major transition in medicine and psychology that happened in the 17th century. In the 21st century, we know that our functioning (as well as the functioning of any other organism) depends on some sort of information processing and that illnesses - physical as well as mental (not that this distinction makes much sense anymore) have nothing to do with spirits, souls or bodily fluids, but have physical causes. That this view of medicine and psychology took until deep into the 20th century to be recognized as the truth, was due to John Locke, who with his Essay Concerning Human Understanding shifted the attention in medicine and psychology to 'ideas' instead of 'anatomy'. One of the offshoots of this Englightenment-mistake is the idea of moral realism. It's only in recent decades that we have shifted towards moral intuitionism: ethics is nothing more (or less!) than our intuitions of what's good or bad. It seems that most of our personal decisions are guided by emotions; only the more distant decisions are guided by logic/rational thought. As Zimmer states: "Sometimes we act like Mill (emotion), sometimes we act like Kant (rational)" (p.294). It just depends on the subject; and neuroscience can inform us when it's important not to give (too much) in to emotion. Zimmer does a good job in explaining all the important steps in this major transition. The revolution in medicine/psychology is one that easily gets overlooked in treatments of the scientific revolution. There are a lot important insights in this book: the influence of alchemy on the discovery of drugs and on the drive to search for physical explanations of the workings of our bodies; the intricate interplay between the political turbulence (Civil War, religious outbursts, the various political factions), the role of Oxford and religious convictions about (the existence of) the immortal soul; the importance of empirical evidence to support scientific theories; the origin of the Royal Society. I’ve enjoyed Zimmer’s books before, and he remains the best science writer I know of who isn’t actually a scientist himself. In this book, he attempts to describe the transition in thinking that happened in the mid to late 1600s, during which alchemy became chemistry and a mystical view of life gave way to scientific thinking about biology and anatomy. As a broad history, it often reads like a summary of notes abridged from a longer textbook. It succeeds in clearly conveying the material, but fo I’ve enjoyed Zimmer’s books before, and he remains the best science writer I know of who isn’t actually a scientist himself. In this book, he attempts to describe the transition in thinking that happened in the mid to late 1600s, during which alchemy became chemistry and a mystical view of life gave way to scientific thinking about biology and anatomy. As a broad history, it often reads like a summary of notes abridged from a longer textbook. It succeeds in clearly conveying the material, but for me, the author’s usually engaging style fails to shine through as much as it should. While much of the historical information was new to me, including the significant contributions of Harvey, Willis and others, the content was a bit dry and occasionally tedious. I learned as much about Restoration England as I did about Thomas Willis and the pre-Enlightenment discoveries that led to the science of neurology and the idea of psychology. Interesting read and well-written, though I felt some of the editorial decisions concerning the structure of the book were a bit inconsistent. Interesting perspectives on John Locke and Thomas Hobbes and Christopher Wren. Interesting if a bit slow at times. The biographical information on various scientists, alchemists, and philosophers was really interesting, as was seeing human understanding make small leaps slowly adding up to more knowledge. I was expecting more balanced chronology, instead of the strong focus on the late Middle Ages and early modern period. Well written with lots of interesting anecdotes, though. A most excellent book on the history of psychology. A wonderful read about the history and discovery of the brain. The well-told story of the beginnings of what would become modern neurology and the paradigm shift that came with it. This book is about Thomas Willis and his compatriots, who in the seventeenth century led the way for a new medical science based in careful observation and experimentation. It's also a book which looks at history, politics and religion, and how these shape the possibility of, and reception to, new ideas. Finally, it is a book which introduces neurology as a science and discusses the spiritual and religious implications of discovering the brain in its neuro-anatomical reality. I found this book a This book is about Thomas Willis and his compatriots, who in the seventeenth century led the way for a new medical science based in careful observation and experimentation. It's also a book which looks at history, politics and religion, and how these shape the possibility of, and reception to, new ideas. Finally, it is a book which introduces neurology as a science and discusses the spiritual and religious implications of discovering the brain in its neuro-anatomical reality. I found this book a little difficult to read, because it is dense with rich historical, political and religious detail. So it took longer than I would expect a 300-page text written in an accessible style to take. But it is accessibly written, and well worth the effort. Carl Zimmer has a clear and imaginative way of connecting ideas, thoughts and concepts to historical and political situation. I would recommend this book to anyone interested in psychology and neurology, but also to anyone interested in how ideas emerge and are shaped by their historical settings. One of the most fascinating parts of this narrative were the details situating Thomas Willis and his work in the backdrop of civil war and restoration, with the way that his social situation - and the kinds of ideas allowed - changed with these bigger, political shifts. The stories of William Harvey (with his revolutionary ideas about blood circulation) and Thomas Hobbes (with his book on government, the Leviathan) provide illustrative and useful contrasts to the reception of Thomas Willis's work, and perhaps some of the hesitancy of Willis to move too far from Galenistic ideas of how to treat disease. Thomas Willis's work in a sense is a brilliant example of the old and the new co-existing in one theoretical framework - he cannot take the steps further into the new, because his beliefs and his circumstances make this dangerous and near impossible. It's also a brilliant example of the mix of scientific method (as it starts to be established) and old philosophical argument (as it starts to be challenged by new ways of thinking) that makes the early natural philosophers such a curious mix of modern and ancient. I'm a science nerd, and I really like reading about the brain. I also like reading about the history of science. So this book was a perfect fit for me. Carl Zimmer is an excellent writer. He has a knack for making science understandable for non-scientists without "dumbing down" the science. The story of the brain ranges from Aristotle to current-day neuroscientists trying to map the brain. Zimmer relates the development of the modern idea of the brain by telling the stories of the men who studied I'm a science nerd, and I really like reading about the brain. I also like reading about the history of science. So this book was a perfect fit for me. The story of the brain ranges from Aristotle to current-day neuroscientists trying to map the brain. Zimmer relates the development of the modern idea of the brain by telling the stories of the men who studied and dissected it through the centuries. As I found in reading another history of science book, "Darwin's Ghosts," dangerous times of civil conflict and rebellion when everything is in flux -- including the accepted scientific wisdom -- are often times when new and radical scientific ideas are generated. There's a lot of intellectual ferment. The old order is crumbling, leaving an empty space, so to speak, for the new order(s) to develop. Zimmer covers the big ideas and the most influential scientists, but he also writes about minor, but critical, characters such as Lady Anne Conway. She lived in England during the mid-17th century and suffered from terrible migraines. Her illness had a profound effect on the research and ideas of Thomas Willis, an English physician who treated her. Here's a passage dealing with Willis: "Thomas Willis was in the process of installing the soul in the brain, which he saw as part machine, part alembic. . . . Illnesses that had been put down to imbalances in the body's humors or even demonic possession Willis now conceived as the wayward actions of mechanical particles." Willis is a crucial player in Zimmer's book and very important to the development of the current view of the brain. It seems clear that Zimmer is determined to resurrect the reputation of Willis, who has been largely forgotten. That's obviously part of Zimmer's agenda in writing this book. I found this book fascinating and well-written. At times it read like a thriller, especially during the British civil war, when Willis and his circle of scientifically minded friends met in secret to discuss and test their ideas. I thoroughly recommend it to anyone with an interest in the brain and how it works. I confess to a Physicist's bias as a general feature of my worldview, which, so as it pertains to "Soul Made Flesh: The Discovery of the Brain and How it Changed the World," means that in general, I'm a reductionist, in that I believe almost all phenomena are reducible to basic mathematical laws, and, less rationally, that only those explanations of phenomena which are so expressed are correct or interesting. What is so interesting, then, about "Soul Made Flesh," which is a lay person's history I confess to a Physicist's bias as a general feature of my worldview, which, so as it pertains to "Soul Made Flesh: The Discovery of the Brain and How it Changed the World," means that in general, I'm a reductionist, in that I believe almost all phenomena are reducible to basic mathematical laws, and, less rationally, that only those explanations of phenomena which are so expressed are correct or interesting. What is so interesting, then, about "Soul Made Flesh," which is a lay person's history of the development of the so-called "Doctrine of Nerves," (that is, that mind is somehow tightly related to the nervous system, particularly the brain) is the way it describes scientists who, to an almost stunning degree, had to operate in a purely pragmatic and messy universe of anatomy and brute experiment to make their discoveries, the meaning of which they could barely conceive, much less put on a rigorous footing. Which is to say that I left the book with a much greater respect for early biological scientists who, unlike Newton or Galileo, who studied things which human technological prowess allowed one to be quantitative about, had to work with much blunter instruments, and to be satisfied with significantly weaker knowledge. And yet had they given up, in pursuit of more tractable problems, we wouldn't be where we are today. The book is reasonably good history, describing the slow progress from the almost purely irrational conceptions or early greek physicians (and the slavish, comic adherence to those notions on the part of early Medieval doctors) to the peculiar state of affairs wherein a man like Thomas Willis, who formulated a theory of the brain which is, more or less, the one we work with now, could be utterly unable to transform that model into meaningful medicine. Men who first conceived of mental illness as a physical problem with the brain still had to treat people with leeches, "steel syrup" and blood letting. I picked this up off the shelves at work where we keep books sent to us for our organization's magazine to review but that we ignored. I was really impressed by it. It's a history of the discovery of our nervous system (and many other anatomical and scientic systems), but it's rendered absolutely fascinating as the author conveys the interplay of these discoveries with the heady and impassioned social, religious, and political contexts of the times. I have a hard time remembering historical event I picked this up off the shelves at work where we keep books sent to us for our organization's magazine to review but that we ignored. I was really impressed by it. It's a history of the discovery of our nervous system (and many other anatomical and scientic systems), but it's rendered absolutely fascinating as the author conveys the interplay of these discoveries with the heady and impassioned social, religious, and political contexts of the times. I have a hard time remembering historical events I read about in books. I am generally much more struck by history when I am traveling and can connect a people's and a place's history to what I am seeing around me. This book, however, provided a sort of unifying context, a narrative thread, on which to weave the intrigues of 17th century England--Charles I and Oliver Cromwell, the Puritans and the Church of England, Boyle, Hook, Willis, and even Wren (he was a surgeon as well as an architect). I was fascinated from beginning to end. I have recently become interested in reading books on medical/disease history and picked this one up based on the look of the cover (I do that a lot) and was presently surprised by this one. Carl Zimmer did some excellent research for this book, my mine interest is United States and World History, and in the process of pursuing my love of history I discovered by reading medical history books, not only do you get history of the particular condition relating to the author's subject matter; you also I have recently become interested in reading books on medical/disease history and picked this one up based on the look of the cover (I do that a lot) and was presently surprised by this one. Carl Zimmer did some excellent research for this book, my mine interest is United States and World History, and in the process of pursuing my love of history I discovered by reading medical history books, not only do you get history of the particular condition relating to the author's subject matter; you also pick up on much of the history of the years covered in the book. That is exactly what Zimmer has done here. 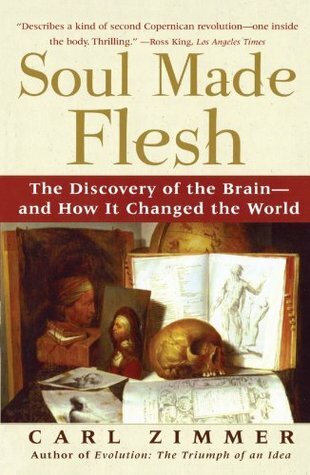 Soul Made Flesh is a fantastic read covering the history of how mankind viewed the brain thorough the ages, not only that he also gives you a good understanding of what was going on in the world around the physicians, alchemists and philosophers who were investigating the brain. This is largely devoted to the study of Willis and his associates who formed one of the contingents of the early Royal Society. Willis is the father of neurology and is rarely discussed in anatomy courses or recognized in the history of science. Yet through a number of horrifying experiments on people and many, many dogs, he and Christopher Wren did for neurology what Harvey did for blood and circulation. One of the best aspects of the book is the exploration of the many talents of people like W This is largely devoted to the study of Willis and his associates who formed one of the contingents of the early Royal Society. Willis is the father of neurology and is rarely discussed in anatomy courses or recognized in the history of science. Yet through a number of horrifying experiments on people and many, many dogs, he and Christopher Wren did for neurology what Harvey did for blood and circulation. One of the best aspects of the book is the exploration of the many talents of people like Wren, whom history only recounts as a great architect, when his field was actually astronomy. He also pioneered injections and staining the brain to trace neural pathways, was able to perform a splenectomy on a dog which survived, and many many other accomplishments. And he is not unusual in having diverse talents in the Oxford circle, a group which provided the largest infusion to the Early RS. Standing on the shoulders of giants, seems to be the only way science can work. Every new idea and path, produces information, even when proved wrong or false. Any curiosity explored, any question that begs an answer, can be steps towards a refined understanding. Besides making clear iterative science at its best when it comes to neurology, Zimmer also placed historical events (I am embarrassed to admit that these events are most clear to me through my reading of Outlander) against a backdrop of Standing on the shoulders of giants, seems to be the only way science can work. Every new idea and path, produces information, even when proved wrong or false. Any curiosity explored, any question that begs an answer, can be steps towards a refined understanding. Besides making clear iterative science at its best when it comes to neurology, Zimmer also placed historical events (I am embarrassed to admit that these events are most clear to me through my reading of Outlander) against a backdrop of scientific discovery, which I am more familiar with than the ascension of English Royalty. I found that fascinating, as it helped my brain in the iterative process of learning. the story of the scientific discoveries of how our brains work. i like the author's writing, i've read several of his books and keep an eye on his blog-the loom, he's an out spoken secularist and physicalist, which forms the philosophic point of the book. it's organization is 2-fold, chronological divided by prominent scientist, so it has a feeling of the steady cumulation of wisdom, of progress, of dynamic movement which makes easier and more interesting reading, although probably doesn't do just the story of the scientific discoveries of how our brains work. it's organization is 2-fold, chronological divided by prominent scientist, so it has a feeling of the steady cumulation of wisdom, of progress, of dynamic movement which makes easier and more interesting reading, although probably doesn't do justice to the blind alleys and errors that also occurred, even the best often missed the obvious and clung to past errors. Zimmmer has written an interesting and accessible book that puts medical science in the context of the philosophical and scientific debates of the scientific revolution. Still, for me at least, this will always be the book in which I learned that Descartes was a bit of a dandy who favoured green taffeta suits and plumed hats. One of the books great strengths is its descriptions of the main players and their relationships (as well as their idiosyncrasies). ‘Soul Made Flesh” by Carl Zimmer is a fascinating examination of the history of the discovery of the brain’s function as the center for rational thought. While 17th Century doctor Thomas Willis is at the heart of this story, it proves to be a much more expansive tale than that just what he found and did about it. Certainly, noggin stuffing is important enough that a lotta pages should be devoted to the many convolutions of its illustrious medical history. Engaging story of early alchemist-physicians who basically discovered the function of the brain and nervous system, thereby radically challenging prevailing views about the soul. In laying out how this all intersected with England's religious and political upheavals in the 1600's, Zimmer shows how powerful an idea can be. Great author, lots of wonderful history here. Not so much information about the brain, but lots of insight into what scientist in the 1600's were seeing and experimenting with as they tried to find the location of the human soul. It follows Willis mainly and includes a number of his original drawings which were delightful. A book about the discovery of the purpose of the brain as more than a pump for the humors or a mostly inanimate blob. While well researched, I felt it dragged on somewhat, and coming away from the book, I felt more educated about past methods of scientific inquiry than the specific study of the brain. It is not just about the history of anatomy or physiology of the brain in XVII century, started by Willis. It' about a group of men that initiated a "scientific revolution". Zimmer proposes to show how a complicated epoch in England affected and, at same time, encouraged men like Boyle, Hooke, Harvey to begin what we know as modern science. A fascinating history of the Western world's discovery of anatomy and the true seat of the "soul" in the human body. The only flaw is that it's not really billed as being specific to Western civilization, but in truth it is, as there is no mention of Asia and Middle Eastern studies of anatomy and physiology.